SUNRISE, FL- The Florida Gators have finally completed their eleven game road/neutral site schedule to open the season. The new Exactech Arena at the Stephen C. O’Connell Center will host Florida basketball on Wednesday night. 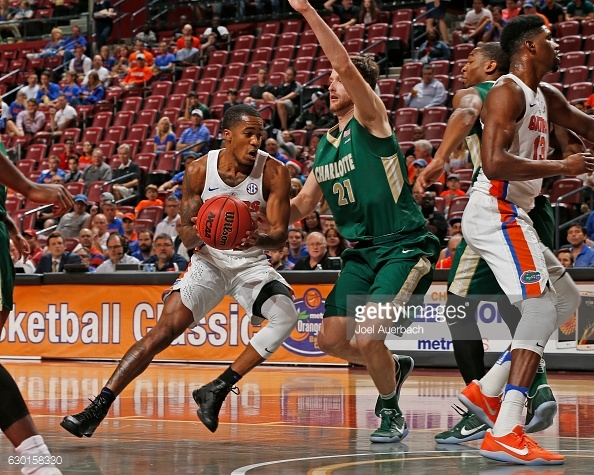 Saturday evening though, the Gators had to play UNC-Charlotte in the Orange Bowl Classic in Sunrise, Florida. The 49ers were no match for Florida. Florida raced out to a 12-3 lead, and extended the lead as the game wore on. Florida led 48-22 at halftime, and was able to use eleven players. Center John Egbunu was unable to play after sustaining a hamstring injury in practice on Tuesday. Florida was led by Canyon Barry with 16 points off the bench. Devin Robinson added 15 points and 9 rebounds in only 20 minutes of action. Forward Keith Stone also scored in double figures with 10 points. Florida easily outrebounded the much smaller 49ers, whose tallest player is only 6’7, even without Egbunu. Charlotte was paced by junior Austin Ajukwa, who tallied 12 points off the bench. Florida will face Arkansas-Little Rock in the first game at the revamped Exactech Arena on Wednesday.